The South Korean government said Friday that it will accept 56,000 foreign workers on the low-skilled work scheme next year, the same number as this year, as part of its efforts to tackle the labor shortage in the manufacturing sector. The committee in charge of managing the foreign labor force also unveiled plans to improve the working and living conditions of migrant workers in the farming sector and to curb foreign workers who stay illegally in the country. Headed by Hong Nam-gi, minister of the Office for Government Policy Coordination, the committee -- consisting of 12 relevant ministries including the Justice Ministry and Labor Ministry -- finalized its plan for foreign workers for next year. It annually reviews labor shortages in each industry and sets the quota for foreign workers based on employers’ needs. According to the plan, South Korea will receive about 42,300 foreign workers in the manufacturing sector, 6,600 in the farming sector, 2,600 in the fishing sector, 2,400 in the construction sector and 100 in the service sector on E-9 visas. Migrant workers in the manufacturing industry will be dispatched to Korean workplaces in January, April, July and October, with 60 percent of them starting in the first half of 2018. The farming sector will receive foreign workers in January, April and October. The plan also set the number of ethnic Koreans from Russia and China on H-2 visas at 303,000 next year. Men on H-2 visas are usually employed in the construction industry and women are usually employed in the service and hospitality sectors as they speak fluent Korean. “We decided on the next year’s quota to resolve the labor shortage facing SMEs, but also to protect local workers’ jobs (from being by foreign workers,)” Minister Hong said. According to government data, the number of foreign workers on the Employment Permit System -- which invites workers from 16 countries in South and Central Asia to fill labor shortages in the fields of manufacturing, fishing and agriculture -- is about 275,000 this year. 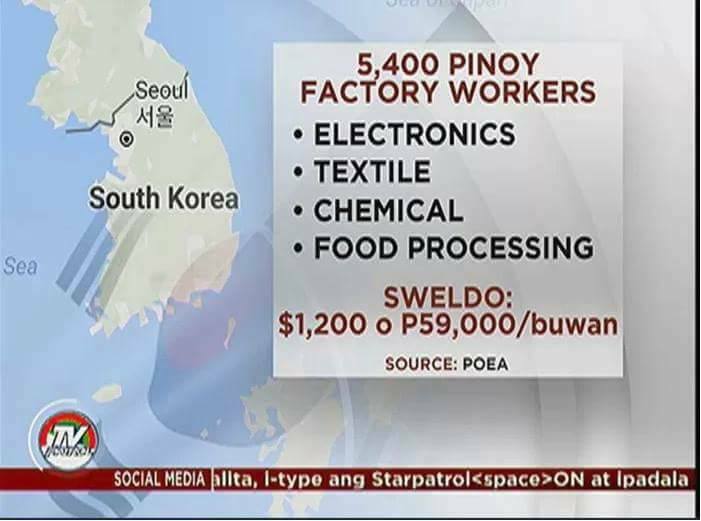 Under the EPS, a state-run agency in each country selects migrant workers based on their language proficiency and sends them to Korea to fill jobs in such sectors as manufacturing, fishing and agriculture, which are shunned by Koreans due to the low pay and poor working conditions. The EPS visa allows them to work here for up to four years and 10 months. Demand for low-skilled foreign workers continues to increase among employers, especially small and medium-sized enterprises, as they seek cheaper labor. They called on the government to allow more foreign workers, but the government remains cautious due to a public backlash over foreigners taking locals’ jobs. The committee also laid out a plan to prevent migrant workers from overstaying their visas and illegally working in the country. It said it will expand the pool of inspectors to crack down on workers who stay illegally from the current 340 to 400, and extend the crackdown period to 22 weeks. Employers found hiring unregistered workers will be penalized when applying for state loans. As for living conditions of workers in the farming sector, the committee said that it will stop providing foreign workers to employers that offer vinyl houses or makeshift houses as accommodation. Many migrant workers in the farming sector live in lodging facilities provided by their employers as they often work far from town, with some news reports suggesting that many of them are forced to live in makeshift houses, containers and vinyl green houses. The government will also allow workers who live in poor conditions and have their wages excessively deducted for the lodging to change workplaces unless their living conditions are improved. Those under the EPS are not allowed to change workplaces except for certain cases such as when they are assaulted or have wages unpaid. They also need consent from their employers to change workplaces. Activists have long called for the abolishment of the EPS, calling it modern-day slavery. They have suggested that the government issue a Labor Permit System that would allow foreign workers to freely change their workplaces without having to get approval from their employers.